Jewelry Auction is a great way to know about the value of the jewelry pieces and to acquire special pieces of art. These auctions are an ideal way for buying and selling rare valuable items at a lower or reasonable price. Is It Really Safe To Buy At Jewelry Auction Houses? If a person has a rare piece of Jewelry or a high end watch they want to sell, the Auction marketplace would be the best place to realize the most value for the item they are selling. However, most people find the process of submitting the item at auction sites a little intimidating and too much of a hassle. Everything has its process and so does auctioning a rare piece, the auction house needs to authenticate all the buyers and the sellers to have a safe transaction for both parties. Auction houses usually charges a commission for each piece or will ask for a fix fee for the publication of your item. It is indeed a complicated process because of the security required, but this is expected since this involves high value items. This process also minimizes the scammers and can somewhat give higher protection for buyers. 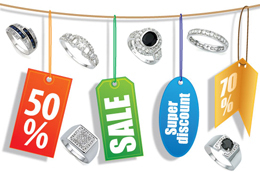 There are a lot of things you need to be careful about Jewelry Auctions. As much as the Jewelry Auction Houses are doing their best to have a secure marketplace for the buyers and sellers, scammers and fraudulent people can still enter the marketplace that can make your experience unpleasant. Beware of scammers if you’re a newbie. Scammers sometimes watch the bidders in high-dollar auctions, most especially on some of the big-name auction sites, such as eBay, and try to dupe unsuspecting buyers out of their money after an auction closes. One of the most known scammer scheme is the second-chance auction scam. This kind of scam has fooled tons of auctioneers so please beware. The second chance scammers usually wait until the end of the auctions. After the bidding ended, they will call some of the non winning bidders to offer a fake second chance to purchase the item and this is usually people asking for payments through wire transfer services. This is something jewelry auctions cannot fully get rid of so you have to be cautious yourself. To minimize the risk of dealing with scammers, you need to thoroughly research the product you are aiming to buy and only transact inside the website. Most of the jewelry auction houses post the price estimate for the items at their website and they would not contact you outside of the website in any way if you did not win the bid. Usually, auction houses separate the higher and lower end items into 2 different events. The lower end items usually include reasonably priced rare items with great catch items. You can surely find great buys at these lower end batches. However, if you really want premium and known brands, then you will probably need to check out the higher end items as well. As long as you do research the real prices of the jewelries and see that the highest bid for that certain piece has a relatively lower price than the original price then you will surely find a good buy.